As many piano mavens are aware these two works are widely regarded as the most technically challenging concertos in the repertory. For the past decade or more they have been by far the most popular selection by candidates in the world's major piano competitions, despite the incongruity that the Rachmaninov Second is more popular than the Third in the concert hall and on recordings and the Prokofiev Third is likewise more popular than the Second. Here, young Chinese-born, New York City-based Yuja Wang (b. 1987) plays both these titans in the same live concert in Caracas, Venezuela. Deutsche Grammophon gives the date of the performances as February, 2013. From information I found on the web, there were two concerts that took place, on February 13 and 14. So, I'll surmise that the performances on this disc may contain passages from both concerts, though if there were splices or edits made in the mastering process, you won't notice them here. And the playing by Yuja Wang…well, it's rather note-perfect and quite exciting throughout. Wang delivers a dramatic, deftly nuanced, passionate and often powerful reading of the Rachmaninov Third. Her first movement begins with a judicious tempo of the main theme, her playing lively and spirited. The alternate theme sings beautifully and the development section is stormy and gripping. Wang's performance of the shorter, lighter cadenza is both brilliant and subtle. The second movement brims with Romantic warmth and a sense of fervent longing, ingredients so characteristic of Rachmaninov. The finale is colorful and blazing in the outer sections, while the middle section contains some of the most spectacular passage work in this concerto you're likely to encounter. The final pages, beginning with that sinister Rachmaninovian buildup, is fraught with suspense and electricity, and the closing chords in the coda fly triumphantly by with such astonishing virtuosity. Wow! The Prokofiev Second, a much darker work (it was written in the wake of the suicide of a pianist friend of Prokofiev – Maxilian Schmidthof), comes across with the same kind of commitment and brilliance. Wang imparts a sense of mystery and eventually of agitation to the lyrical first movement main theme, using a mixture of soft dynamics and muscular playing that can sometimes turn curt. The quirky alternate theme is plucked out boldly by Wang, giving the music a sassy yet surrealistic character. 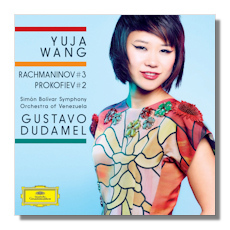 Wang delivers the challenging nearly five-minute cadenza brilliantly, closing it with both power and panache in the racing chords leading up to the crushing return of the orchestra. The second movement sizzles with both flash and elegance, and the grotesque third movement is fully convincing: it sneers, chuckles, seduces and then crushes you with overwhelming force. Is there an ending in some other work that comes on with this kind of bizarre Armageddon? The finale opens with a rapid tempo and Wang delivers the main theme crisply while conveying the music's hectic sense. She points up the agitated lyricism in the alternate theme and delivers an utterly thrilling ending. In both works Gustavo Dudamel draws splendid playing from this talented youth orchestra. Collectively they perform nearly on the level of some world-class orchestras. DG's sound reproduction is vivid and powerful and the audience noise is at a minimum. I would have to rank Wang's Rachmaninov Third with the finest past efforts by Glemser, Janis, and Mogilevsky. Her Prokofiev Second reaches similar high plateaus, joining such formidable company as Gutierrez, Ashkenazy, Beroff, Yundi Li and the recent and very convincing Anna Vinnitskaya (Naïve V5238). Wang's CD is a must for those interested in 20th-century piano concerto repertory. Highest recommendations!